Sunday morning was a little bonkers at my place and so was breakfast. 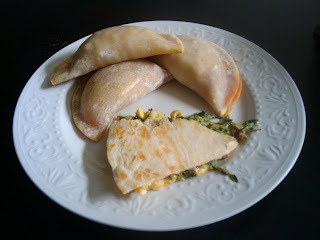 So, that lead to 2 “Mexican Breakfast” offerings…The quesadilla was the same as the Egg and Spinach Burrito, but after scrambling the eggs and spinach I put them on a tortilla in a skillet added some cheddar cheese and cooked for 3 minutes on each side until the tortilla was crispy. (all the spinach is gone now, so you won’t see that for a while). The empanadas turned out better than expected. I hope you enjoy them as much as I did! Preheat oven to 325 degrees. On a floured surface, using a floured rolling pin flatten out the empanada wraps just a little. Brown Chorizo Sausage over medium-high heat and drain off grease. Scramble 4 eggs over medium heat until just done and still a little runny. Prepare a baking sheet with non stick spray. Fill each wrap with 1 tbl each of egg, cheese, and chorizo. Dip your fingers in a small bowl of water and wet the outside circumference of the circle, fold in half making sure to get a good seal. Create an egg was by stirring the 5th egg with a little water, using a pastry brush paint the top of the empanadas with this to ensure browning. Bake for 18 minutes and let cool for a good 5 minutes before serving. I got the joy of eating this delicious breakfast! I must say it was absolutely great, and I really hope I get to eat it again! The perks to living with the cook are wonderful, I love being a taste tester!